The Canon A700/A710/A720 Adapter Tube 52mm from Bower is a conversion adapter tube for Canon A700/A710/A720 digital cameras. Auxiliary lenses and filters with 52mm thread can be attached to the camera using this adapter. 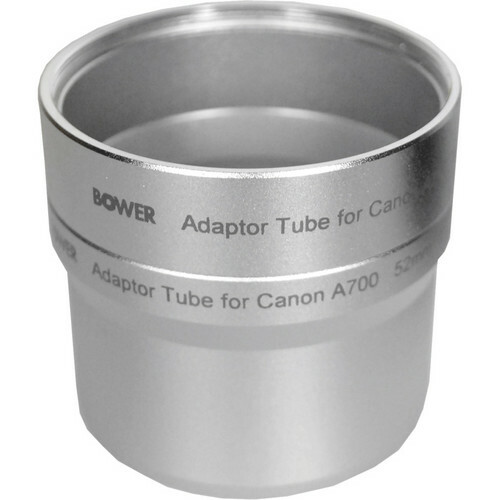 Lightweight aluminum construction, seamless lens fit and a design geared towards optimum stability make this adapter tube a great asset to your camera. Enjoy the security of a lifetime warranty. Box Dimensions (LxWxH) 3.0 x 2.6 x 2.5"
Canon A700/A710/A720 Adapter Tube 52mm is rated 5.0 out of 5 by 1. Rated 5 out of 5 by NZKiwiBro from Does the Job Using on a Canon A710 IS with adapter rings and a Raynox DCR-250 Macro lens for copying Photo Slides.